Naruto is a suburban town of Tokushima. It is extremely small and serves almost no points of interest. However, they do have one major claim to fame “The Naruto Whirlpools”. Naruto is on the north-eastern tip of Shikoku. It is the main link between Shikoku and Kansai. While most people will just race through this area going to either Takamatsu in the west and Tokushima in the south, twice a day the town is buzzing with tourists. It is very important that you check the schedule for the whirlpools, or you will end up visiting and seeing nothing. 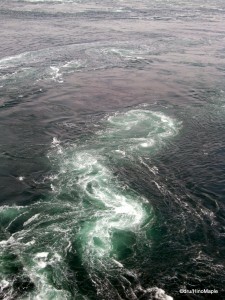 The whirlpools are a natural phenomenon that occurs during the peak of the high and low tides. This is when the tidal waters of the Naruto Strait, shifts causing whirlpools to form on both sides of the strait. The best time to see the whirlpools is during high tide, but low tide is also good. 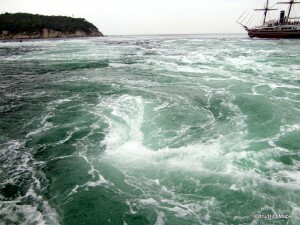 To find the whirlpools, all you have to do is head for the Naruto Park, which is under Naruto Bridge. The first thing you should do when looking at the whirlpools is take a boat cruise. Just past Naruto Park, you will be able to find a small ferry port where there are two cruise ships, a large one and a small one. They both leave two to three times an hour. If you look at their website, you will be able to determine the peak whirlpool times. You have roughly one hour before and after the listed time, in red, to see the whirlpools. I believe it’s best to arrive roughly one and a half to two hours ahead, especially on weekends. These boats will take you directly into the whirlpools where you’ll cruise inside the tidal area for about 15 minutes before returning to port. On my trip, I took the smaller ship which has a very interesting compartment. You are seated inside the hull where you have many windows below the surface. As you leave port, you can see a few jellyfish swimming about, but there really isn’t much to see. You can head up on deck a little to enjoy the scenery and see Naruto Bridge approaching. As you approach the whirlpools, you are ushered back into the hull where you can see the whirlpools from under the sea. It is like a large bottle of champagne that is bubbling and frothing. It was interesting to see, for about 10 seconds, but in reality, you want to get on deck as soon as possible. Once on deck, you can see all the action. You will be really close to the whirlpools and you’ll experience the rough seas. Beware that small children, and especially babies, should be well taken care of. After floating around inside the waters, you are quickly taken back to the port to reminisce of your adventure. After a cruise, you can easily drive back to Naruto Park and enjoy the whirlpools from a higher vantage point. There isn’t too much to see in the area, but you can venture out under the bridge. You can walk roughly 450 metres out and enjoy the spectacular views. You will be 45 metres above the whirlpools, and there are several windows in the floor that allow you to enjoy the view below. 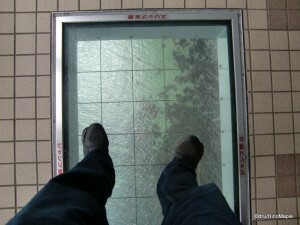 Do be warned that there are big red letters on the glass that says “DO NOT JUMP!” in Japanese. Unfortunately, I found out AFTER I had jumped. The entire walk out onto the bridge is a must see, in my opinion, and worth the fee. However, if the whirlpools have stopped, I might take a second thought before heading out. The park itself has many things you can see and do. For children, there is a museum about whirlpools with several interactive machines to play on. There is a long escalator that goes to a series of restaurants on a mountain, and several short hiking trails in the area. If you have a full day, you can easily venture around and enjoy yourself. There is also a “replica” art museum. This place holds nothing more than replicated works of art, including a replica of the Sistine Chapel. If it’s too expensive to travel around the world, this museum can offer you a taste of the best art under one roof. Naruto’s last claim to fame is their sweet potatoes. It is considered the sweetest sweet potato in the world, but I’ll let you be the judge of that. It is definitely worth a taste. Other than that, there is no reason to really stay in Naruto. After seeing the whirlpools, you can easily head back to Takamatsu, Tokushima, or even Kobe. 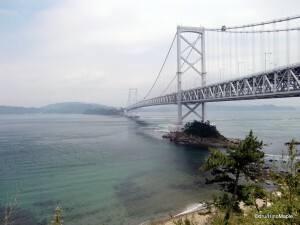 Kobe is a short drive across the Awaji Island and the Akashi Bridge, the longest suspension bridge in the world. You can even venture onto Awaji Island and camp along one of the beaches. It would provide a great tale. This entry was posted in Shikoku and tagged Akashi Bridge, Akashi Ohashi, art museum, Awaji Island, Awaji-jima, boat cruise, ferry port, high tide, japan, low tide, museum, Naruto, Naruto Bridge, Naruto Ohashi, Naruto Park, Naruto Strait, Naruto Whirlpools, park, promenade, replica art museum, Shikoku, Sistine Chapel, Takamatsu, Tokushima, Tokushima-ken, whirlpool, なると, やまい芋, 四国, 徳島, 明石, 明石大橋, 淡路島, 舟, 高松, 鳴門, 鳴門海峡 by Dru. Bookmark the permalink.